In 2014 and 2015, most European countries have been struggling with the problems of refugees and immigration. The sheer dimension of the phenomenon (hundreds of thousands of persons, going on to the millions) and the short time-span over which it has developed, have caused huge humanitarian, economic, logistic, social, political and security problems. The main routes to get from Africa and Asia into Europe. Let us try to approach this highly sensitive issue trying to avoid the emotion-laden, politically-correct speech. THE ORIGINS: The refugee component of the problem derives from war and persecution and is, to a great extent, caused by the Syria Civil War. Four out of every five refugees nowadays are Syrian. Then, there are the wars in Yemen, Iraq and Afghanistan and the conflicts and persecutions in countries like Libya, Somalia, Eritrea, or the Sudans. The evolution, resilience and lack of optimistic prospects for any of these situations DOES NOT point to any short-term satisfactory resolution, which means that each of them is going to continue “to produce” refugees. HUMANITARIAN: This is the most dramatic feature of the crisis. Over 4 years of relentless war in Syria, have resulted in millions of refugees spilling out of her borders, plus about 8 million internally displaced. Three of Syria’s neighbours have obviously received by far the largest share of these refugees: Turkey – 2.5 million; Lebanon – 1 million; Jordan – 600.000. For equally obvious reasons, the other two neighbours (Israel and Iraq) do not count. Then, there are over a million (and counting) refugees pouring into Europe. These refugees deserve care, attention and respect. ECONOMIC: The economic issues are pretty straightforward. This mass dislocation places a heavy burden on the frontline states (Turkey, Jordan and Lebanon) and on the countries of refugee entrance in Europe, mostly Italy and Greece. And there is only so much that each can bear, especially in economically vulnerable ones like Lebanon, Jordan and Greece. LOGISTICS: No country was prepared to handle this flood of refugees. The overwhelming numbers strain the states’ services, hurt the refugees and cause tension and stress which, in turn, tends to aggravate the situation. SOCIAL & POLITICAL: Chancellor Angela Merkel, in a fit of emotion, announced an open-door policy towards Syrian refugees. This apparently thoughtless outburst led to a renewed wave of people trying to get to Germany and caused a domino effect that placed further stress on countries such as Macedonia, Serbia, Hungary, Croatia and Austria, some of which chastised the Chancellor for enticing more people to come to Europe. The domino effect found its way back to Germany, where not too few considered Merkel’s move hasty, extemporaneous and even reckless. Among these, were officials of Merkel’s own party and in Bavaria’s CSU. Not surprisingly, soon after, Germany started to backpedal on the open-door proclamation. Instead, Germany decided that her generosity had to be shared by her neighbours and, in typical last decade authoritarian fashion, threatened the Visegrad Group (Hungary, Czech Republic, Poland and Slovakia) and Romania with punitive measures if they did not take more refugees. This bullying culminated in a majority vote in the European Council to impose quotas on member states. * Why should countries have to contribute to Germany’s largesse? * How will refugees feel about having to settle in countries that are reluctant to receive them? * How will countries that are reluctant to receive a bigger number of refugees, will actually receive them? And how will their populations react? * How will the increasingly large number of “false” Syrians from the Middle east, South Asia and North Africa be spotted, handled and eventually deported? * How will the “free-riders” from the Balkans be processed? * How will the security issue be handled, given that there is the real possibility (it is already most likely a fact) of there being members of terrorists organisations embedded in the refugee flux? * How will the feelings, sensitivities and opinions of local and national communities be taken into account without labelling everyone as racist, fascist, or xenophobic, because most actually are not. Finally, there are questions that should be asked about the refugees themselves. If you are a refugee from a war zone, running from the danger of you or your family being killed, you do not get to be too choosy about where you end up. If you escape Syria and settle in Turkey, in Lebanon, or in Jordan, you are safe from violence and the war. Ok, the conditions are prickly. So you try to get to Europe. However, once in Europe, Greece is not good for you. Neither is Serbia. Nor Hungary. Not even Italy. No, you have to go to Germany or Sweden. The way I see it, this is not fleeing from war anymore. You are becoming less of a refugee and more of an immigrant. Nothing wrong with that. It’s just that changing condition and motivation, so changes your status quo, too. It is time to stop having a one-dimensional view of the refugees (true or fake), of the Europeans who want more or less refugees and/or immigrants. It is also time to stop bullying and demonising states and people because they think differently. It is also about time to look deeper to what people are saying and doing. For instance, the Swedish Justice Minister, Morgan Johansson attacked Prime Minister David Cameron on the immigration issue saying he was “playing politics” and that Sweden granted many more asylum applications that the United Kingdom. Unfortunately for Mr. Johansson, there are figures that show that non-European foreigners in Sweden do not dwell that well: whereas the unemployment rate for Swedes is at 7%, for non-Europeans is a staggering 28%! On the other hand, in the UK the unemployment rate for Brits is 6% and for non-Europeans is 8%. So much for the evil British and the pristine Swedish. The “producers” of refugees (the likes of Syria, Iraq, Eritrea, etc) are “producing” masses of refugees. The “consumers”/recipients of refugees are being overwhelmed by more refugees than they can or are willing to take. Unfortunately, there really isn’t one. THE REFUGEE “PRODUCERS”: the Middle East Wars raging on are complex, multifaceted, entrenched, that feed on ethnic and sectarian fear and hatred and which are compounded by the involvement of multiple foreign actors with their own agendas. This means that the best solution which would be to deal with the problem at the source is not an option in the foreseeable future. THE NEIGHBOURS: The countries neighbouring the conflicts are split into two groups: the ones that have not taken a significant number of refugees (like Saudi Arabia, Iran, Egypt, or the Gulf States) do not give any sign of overture to change their stance. The ones that have borne the brunt of the effort have a limited economic, logistical and even political capability to keep on receiving refugees. So, with the will not on one hand and the cannot on the other, it is not realistic to expect that the Middle East can provide much more in terms of refugee relief. THE EUROPEAN REFUGEE “CONSUMERS”: This is where the attention is focused on. To be realistic, neither the take-every-refugee crowd, nor the no-entry sympathisers are tuned to reality. It is neither feasible nor fair to just kick every would-be refugee out. It is neither feasible nor acceptable to many, to flood small communities with a wave of refugees. You cannot look the other way and pretend nothing is happening in Syria, but you cannot force refugees into places where they are clearly not welcome. You do not want people to linger indefinitely in refugee camps, but you do not want people to be attacked or rejected by locals who do not want to change their ancestral modus vivendi. You have a moral duty to help people in terrible distress and you have a moral and political duty to respect your fellow citizens and electors. There needs to be good sense and balance approaching these issues. We do not live in an ideal world. Between receiving millions of people and kicking them all out, there are a million other alternatives. Each European country should find its point of equilibrium that mitigates the refugee problem and accommodates its population’s sensitivities. Diktats from Berlin or Brussels will only serve to increase feelings of revolt, resentment and rejection. That is to no one’s benefit. 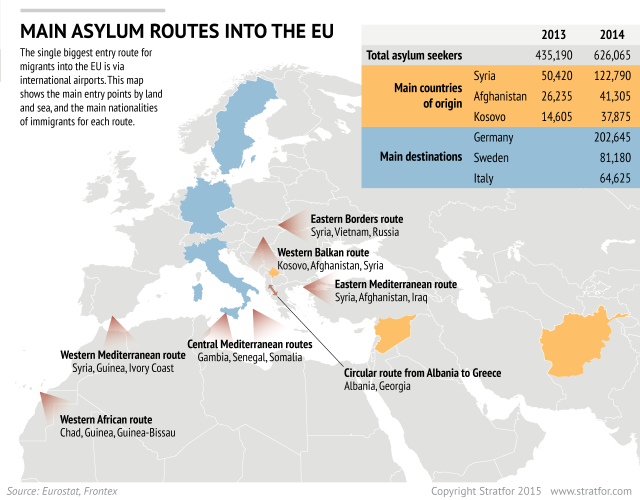 A good look at the refugee situation in Europe, and the complexities involved. I would disagree on one major point. The fact that many refugees do not settle in the countries in which they arrive does not make them migrants. They are not in search of better opportunities, they fail to find possible ones, having failed to find refugee status, stable work, education and housing on whatever beaches they wash up on. "Finally, there are questions that should be asked about the refugees themselves. Ok, the conditions are prickly. So you try to get to Europe. However, once in Europe, Greece is not good for you. Neither is Serbia. Nor Hungary. Not even Italy. No, you have to go to Germany or Sweden. The way I see it, this is not fleeing from war anymore. You are becoming less of a refugee and more of an immigrant. Nothing wrong with that. It’s just that changing condition and motivation, so changes your status quo, too." Estas dúvidas não são exclusivamente minhas. Aliás, foi por ouvir outras pessoas a abordarem o assunto sob essa perspectiva que também comunguei das mesmas interrogações. Loved reading it, a wholistic view of the issue. Thank u.
I beg to disagree. Many come with their set on Germany, Sweden, they do not wait for their situation to be processed. That is not about war anymore. Pois essas interrogações existem e são legítimas e por isso é importante fazê-las e não ter receio das respostas. You're welcome dear Seema! I am proud to have you as a reader!